Without a doubt, the most powerful feature of Subtext is the ability to make Storyform Connections. Sure, building a story from a source of conflict is great, but being able to build a story by picking the precise Storypoints that make up that story? Well, that's something else entirely. Of course, you'll need to know a thing or two about the kind of Storypoints that make up a complete narrative. The Explore section of Subtext is a great place to start, as is the entire decade of articles, blog posts, and podcasts on our parent site, Narrative First . 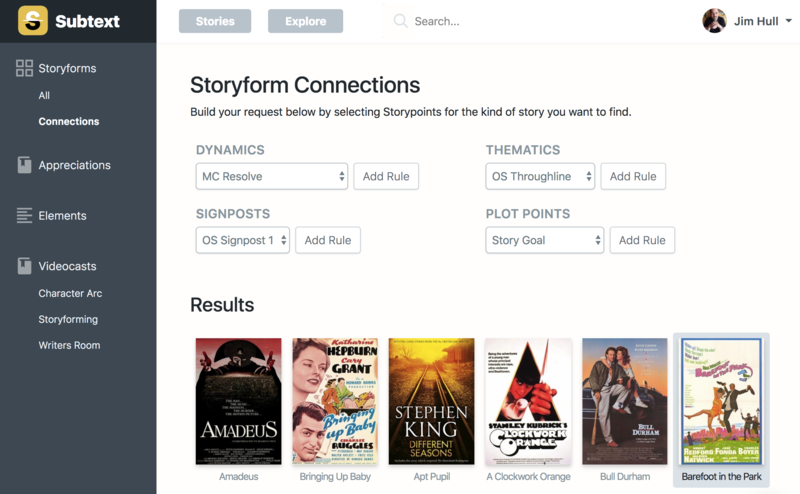 When you know the parts of your story that are most important to you, but also want to check it against the 420+ story structures curated by our professional story structure experts, then you'll want to make some Storyform Connections. Dynamics cover both the Character and Plot Dynamics found in a particular storyform. 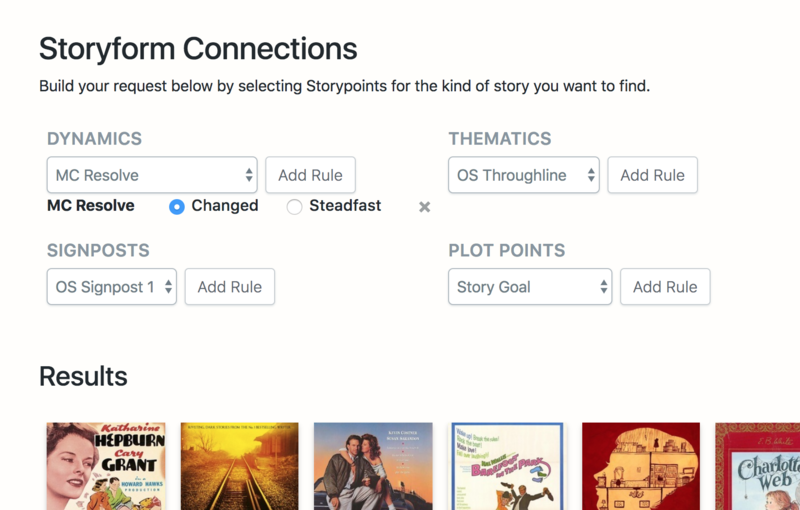 Dynamic Storypoints like whether or not the Main Character Changed their Resolve or remained Steadfast, and whether the Overall Story ended in Success or Failure--these are the kinds of options you'll find listed under the Dynamics section. To filter the list of available Storyforms, select the Dynamic from the dropdown menu and tap Add Rule. The Dynamic Storypoint will be added, along with an opportunity for you to choose the appropriate setting. Make your selection, and Subtext will filter out all the stories that don't fit your search criteria. Note how the selection of Changed Main Character Resolve removed Amadeus from the list of possible stories. Salieri is a Steadfast Main Character. Thematics offer rules for filtering based on the individual Throughlines of a Storyform. Signposts give you a chance to search for stories based on what is happening in each Act. Plot Points provide writers a chance to zero in on the major Storypoints of a narrative like the Story Goal and the Story Consequence. Once you find a story that peaks your interest, select it, and Subtext will show you the entire Storyform for that title--including the all-important Narrative Argument. If this sounds like the kind of story you want to tell, simply tap Build a Story, and Subtext will quickly build an entire outline for you based on the theme and character development needed to make that Narrative Argument. If you don't like that particular Argument, you can return to the Storyform Connections view and alter your search rules. Note that Subtext opens up a Storyform from Storyform Connections in a separate tab within your browser. This makes it easier for you to check several different Storyforms at once, without having to continually move back and forth.